In a turn of luck, I've recently had the opportunity to try a few different non-traditional care treatments. While runners can certainly benefit from a range of treatments, the same can be said for everyone. Life is stressful and can be hard on the body, and since it's the only one we get, we should be good to it. Try something for me. Get up out of your chair and try to touch your toes. How does that feel? Now, stand up straight, put your right hand over your head and reach as far to the left as you can and count to 15. Now switch arms and bend to your right. How did that feel? Chances are you felt some tugging and tightness. Maybe you couldn't touch your toes. Maybe your back cracked or your neck felt heavy. Maybe it was the easiest thing you've done all day. We tend to carry a lot of stress in our bodies, I know I certainly do, but we don't have to live in pain or feel mildly uncomfortable all the time. Fact: as I write this I have a tight knot in my neck that's making my head feel like a million pounds. 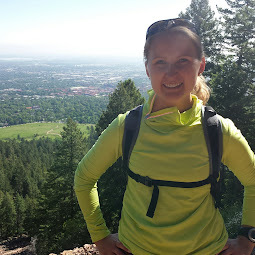 I'm always looking ways to lower stress, relax, stop my shoulder from hurting, and support my running, that will work consistently and hopefully last longer than a few hours. 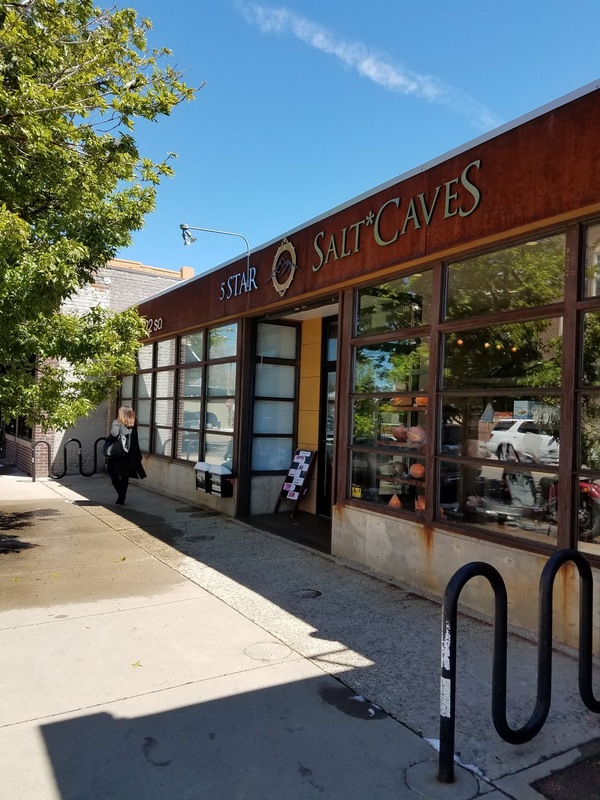 When a local bike shop turned into a place called 5 Star Salt Caves, we were curious what it was all about. And then the Groupon offers started. So needless to say, we decided to give it a try. Several different services are offered, but we went for the main attraction - the salt cave. In addition to stimulating deep relaxation, Halotherapy (or sitting in salt) is the use of salt vapor to treat or prevent respiratory ailments and skin irritations, and to help combat headaches, dizziness, nausea, indigestion, and more. 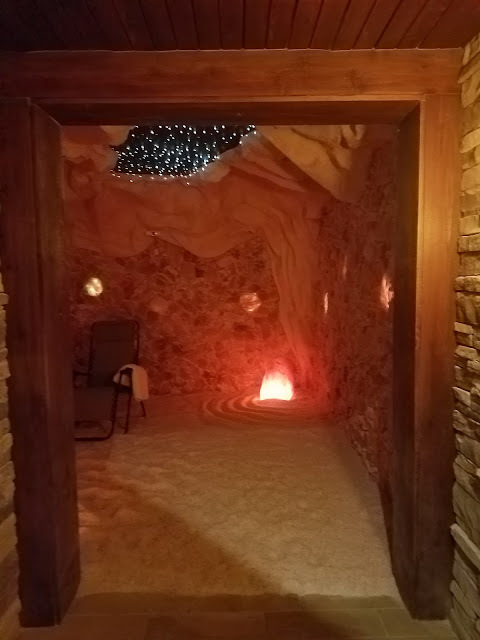 In reality the cave is a room with several inches of pink Himalayan salt covering the floor, blocks of the salt covering the walls, several salt lamps placed throughout the room and the dark ceiling has strategically placed twinkle lights to resemble stars in the sky. When we were led into the room we were directed to one of eight or so lounge chairs - more of the outdoor type than the lay-zee boy type - with a blanket and a small basket for personal items. This is not a private treatment, nor does it involve any strenuous movement, so comfortable clothing is recommended and clean, white socks are required. All I can assume is that dirty, colored socks can change the color of the salt. But that's just a guess. After everyone was settled in the lights were dimmed. Since phones aren't allowed and it's not a place to catch up on the latest gossip (silence is golden), the only option is to just lay there for 50 minutes and take a little nap if you'd like. It takes a lot for my mind to slow down and for me to stop obsessing over my to-do list, so the music and twinkling "stars" were welcomed distractions. After a while I was able to switch my focus and relax a bit. While I may have fallen asleep for only a flash, the fifty minutes did go by more quickly than I expected, which I was thankful for, but also not quite ready to get back to my day. I was really hoping that it would help clear my sinuses and relieve congestion, and while I was able to breathe freely after a few minutes, the effects quickly dissipated once we left. I think so. It seems like a type of experience that you have to experience a few times to get the full benefits of. If nothing else, it helped me relax and I was in a pretty good mood the rest of the day (although, the fact that it was also my birthday may have had something to do with that!). Five Star Salt Caves in Denver often has Groupon offers, so I'll try and take advantage of that again, as $35 for 50 minutes would be a bit expensive on a regular basis. Sound off: If you've tried Halotherapy before, what did you think? * What's the oddest treatment you've tried to cure or prevent an illness or injury?